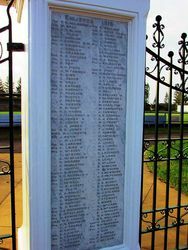 The gates were erected to commemorate those from the district who served in World War One. The gates were restored and re-opened in 2012. The ceremony of unveiling the Merewether Memorial Gates was performed on Saturday afternoon in the presence of a large gathering of the public, and in pleasant weather. A detachment of Naval Reservists and a squad of cadets formed a guard of honour in front of the gates, which form the principal entrance to Mitchell Park. 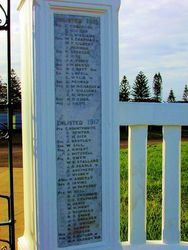 They are hung on four massive stone pillars, the names of the soldiers who enlisted from Merewether being worked into the granite slabs on the front of these. On the top of the two larger central pillars are set two marble busts, representing a sailor and a soldier, while the smaller pillars are surmounted with spherical caps, also of marble. 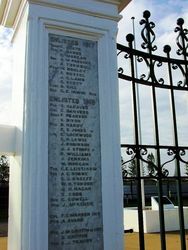 Alderman R. Wells, president of the committee, who presided, said that the gates were erected by the citizens in commemoratlon of the service and sacrifice of the men who fought and fell in the war. Of the 322 men who enlisted 44 had given their lives for the cause of freedom. It was about two and a half years since the movement was initiated, and with the exception of six months during the influenza epidemic in 1919, the committee had met fortnightly. The result of the effort was that a memorial had been erected that would stand as an everlasting tribute to their soldiers. The cost of this was between £400 and £700, and practically all of the money required had been raised. 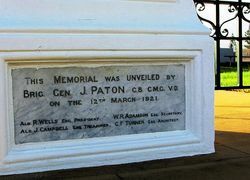 In unveiling the memorial Brigadler General Paton said he was pleased to be present to take part in the ceremony, because it represented the tangible efforts of the people of the municipality to show their gratitude and appreciation of those who in the Empire's direct trouble, went forth to battle. The memorial was designed by Mr. G. Turner, of Merewether, and erected by Messrs. Pickles and Brougham, of Hamilton. 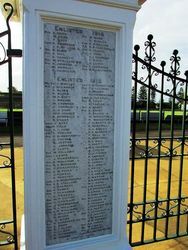 Among the wreaths hung on the gates were three from the proprietors of Newcastle A Colliery, in memory of Privates G. Ruddy, G. M'Leod, and T. Allanson, former employees of the company of its Glebe mine. Fell In The World's Greatest War. War Declared 4th August 1914. 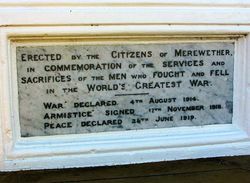 Peace Declared 28th June 1919. Brig. Gen J. Paton C.B. C.M.G. V.D. On The 12th March 1921. Ald J. Campbell Esq Treasurer, G.F. Turner Esq Architect. an initiative of the Merewether RSL Sub-Branch. from the City of Newcastle.